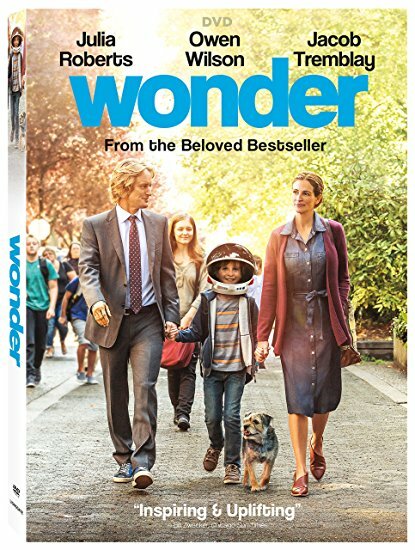 Wonder is a beautifully enriching movie based on R J Palacio’s bestselling novel, which tells the incredibly inspiring and heart-warming and unforgettable story of August Pullman, a boy with facial differences who enters fifth grade, attending a mainstream elementary school for the first time. We were asked if we would like to review Wonder, the DVD, and immediately said yes, and we’re so glad we did. Talk about a captivating, touching and sweet movie! Wonder is about about little August Pullman. Auggie loves doing ordinary things. He loves Star Wars and his video games, and above everything else, Auggie wants to be an ordinary boy. Having been home schooled, Auggie’s parents make the decision to enrol him in a mainstream private school now that he has reached middle school years, and let us tell you, the scenes between Auggie and his Mum, Isabel, as they argue the advantages and disadvantages of Auggie going to school will break your heart – we really felt, and understood, both of them. Auggie finds it difficult to fit in at school, immediately feeling ostracized by the other children for looking different, that is, until he is befriended by another classmate named Jack and the interaction between the two boys is breathtakingly sweet. Jack sees the real Auggie. The funny, caring, sensitive and sweet boy his family have the pleasure of living with every day. If only his other classmates could see the boy beneath. There’s so much warmth and emotion in this movie together with smile inducing wit and wonderfully moving moments throughout, and the cast is spot on. The chemistry between all the characters is perfectly brought to the screen in this unforgettable story of tolerance, acceptance, courage and the message it brings will give you food for thought long after you’ve watched this beautiful movie. Julia Roberts as his Mum……Isabel Pullman is a delight, and as mother’s we really felt her pain. Owen Wilson as Auggies Dad, provided the warm wit to the movie, Jacob Tremblay who plays the irrepressible Auggie was an absolute delight. He was such a soulful little actor. A very talented and sweet boy who you might remember from The Room. And last but by no means least, Izabela Vidovic who plays Olivia “Via” Pullman pulled at our heartstrings, as the daughter/sister who walks in Auggie’s shadow. You’ll need tissues because the inspiringly beautiful crescendo this film builds to will have you weeping and applauding this courageous young man who proved ordinary can indeed be extraordinary. Whatever you do, do yourself a BIG favour and grab this DVD and watch it with the family. Your heart will thank you! Wonder is a beautifully enriching movie based on R J Palacio’s award winning novel, which tells the incredibly inspiring and heart-warming and unforgettable story of August Pullman, a boy with facial differences who enters fifth grade, attending a mainstream elementary school for the first time and his fight to fit in, to be ordinary.